People looking for the maximum space and performance Ford has to offer will naturally be attracted to the 2018 Ford Explorer, right here in Cincinnati, Oh. For larger families or drivers that require an extra amount of cargo space from their SUV, the Explorer, starting at $31,990, is one of the best options that combines a high towing capacity of up to 5,000 pounds with convenient driving features such as all-wheel drive and terrain management. For ultimate performance lovers, the 3.5 L EcoBoost engine is a notable highlight that will deliver up to 365 hp and 350 pound-feet of torque. Performance aside, the 2018 model also sports some convenience and safety features such as Ford’s intelligent cruise control, curve control, Sync 3 voice control, and FordPass app. It’s the perfect blend of convenience and performance in a large SUV that sits high for extra visibility on the road. Combined with Kings Ford’s outstanding quality and expert service, there’s very little else to want when it comes to buying a 2018 Ford Explorer from our lot. 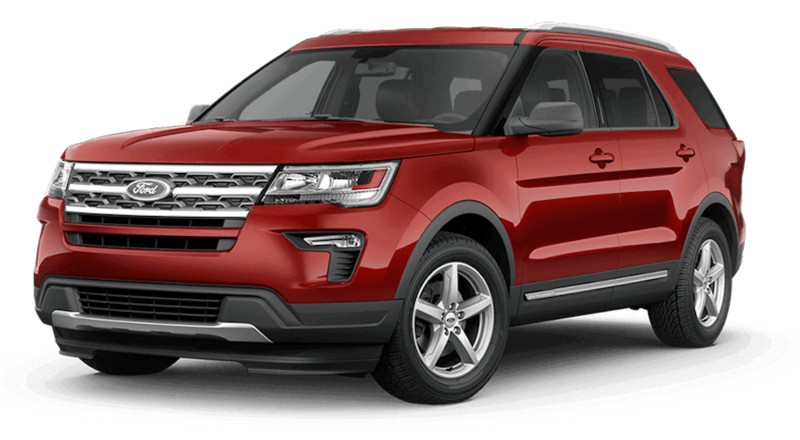 More than anything else, a large SUV like the Ford Explorer blends high-performance, comfort, and cargo space into a single unified body. For people needing a lot of carrying capacity or wanting to take the occasional road trip, the Explorer’s extended interior space will be a prime selling point. The inside of the SUV sports three separate rows for a total capacity of up to eight people. The second and third-row seats fold down to increase the overall cargo capacity to up to 80.7 square feet. If you want additional space to store luggage, bikes, or other adventure toys, the built-in roof rails can hold any number of aftermarket accessory and cargo racks. The infotainment system includes the handy FordPass app and other common applications such as Pandora, NPR, Spotify, weather reports, etc. FordPass can conveniently connect the SUV to your smartphone, enabling control over the engine, locks, and vehicle status such as fuel and oil levels. Built-in USB/outlet charging stations will also keep up to four devices, including 110V plugs, powered through the vehicle’s battery system. Audiophiles will appreciate the premium Sony audio package that equips the interior with 12 separate speakers. The system includes features to reduce distortion while enhancing the overall clarity of audio automatically. Tied into the SUV’s built-in infotainment, you can pump out music from your favorite apps such as Spotify, Pandora or your own smartphone connected via Bluetooth. In total, the sound system delivers up to 500W of power. Beyond the performance of an SUV, the most important thing for many individuals, especially those with family, is safety. Thanks to the dedicated development of Ford’s safety line of features, the 2018 Ford Explorer is one of the safest large SUVs on the road today. This is, in part, due to the vehicle’s extensive airbag system that includes driver and passenger front, side, head, and knee airbags. In addition to the standard safety features, many trim levels also include additional options such as the adaptive cruise control and enhanced active park assistance. The adaptive cruise control allows you to set and maintain a specific speed without pressing the gas pedal. Sensors in the front will detect cars ahead of the vehicle and adjust the speed accordingly. This will help prevent an accident ahead of time without you having to maintain active control of the speed. For parking, the active parking assist can help with challenging parking situations. Ultrasonic sensors scan around the vehicle for available parking spaces and will provide assistance as you maneuver the SUV. The sensors provide 360-degree coverage with an emphasis on the front and sides for parallel parking, reverse parallel parking, and park out maneuvers. The driver maintains active control of the shift, brakes, and accelerator. The Ford Safe and Smart package adds a number of driver assist features in addition to the adaptive cruise control. Blind spot sensors will alert you to cross traffic during lane change maneuvers. The lane keeping system will also alert you to unintentional drifts while cruising at highway speeds. The forward collision warning system can engage the brakes automatically to prevent a forward collision more quickly than the driver alone. Finally, the Sync 3 voice-activated technology allows you to control many of the advanced interior features without having to take your hands or eyes away from controlling the vehicle. Using the system, you can command the optional navigation system, operate handy features such as restaurant and gas station searches, or even connect to and control your smartphone to make calls or check messages on the fly. The voice technology ensures a clear and accurate response each time you use it. The 2018 Ford Explorer comes with three engine options that range from two EcoBoosted, turbocharged engines to a 3.5 L, twin independent variable camshaft timing V6 engine. The base engine option offers up to 280 hp and 310 pound-feet of torque. This alone is enough for most people with an average towing capacity of up to 2,000 pounds. At this level, fuel economy ranges from 16/22 or 17/24 city/highway depending on if you go with the forward wheel or all-wheel drive option. Taking it up a step, the 3.5L EcoBoost engine is a six-cylinder powerplant with 365 horsepower and 350 pound-feet of torque. This engine is the standard for the Explorer Sport and Platinum packages and also comes with forward wheel and all-wheel drive options. Fuel economy is around 18/25 (all-wheel) or 19/27 (forward wheel) city/highway. Towing capacity remains around 2,000 pounds. For the ultimate in engine performance, the independent camshaft engine gets about 16/22 city/highway MPG but increases the max towing capacity to nearly 5,000 pounds. With 365 hp at 5500 RPM, this six-cylinder engine will match the performance of many standard trucks while offering the same level of comfort and convenience of a larger SUV. The intelligent AdvanceTrac with Roll Stability Control system helps to keep the vehicle stable while in motion while at high-speeds or during tight turns. The system can detect wheel slippage and unnatural sway, then respond by transferring torque between the front and rear wheels on the AWD models for extra traction. It can also reduce engine throttle and apply brakes to bring the SUV back under control, avoiding a potential crash or rollover. 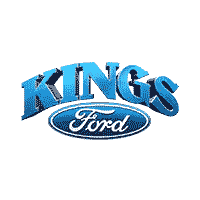 Kings Ford is all about quality vehicles and great customer service. We understand that buying a used or new vehicle can be a difficult process. You want to find the best vehicle for your needs at the best price. That is why everyone who works on our dealership is committed to finding you the exact car you’re looking for. 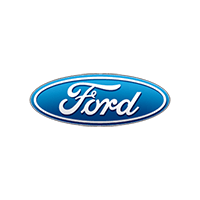 Every single one of our staff is experienced and knowledgeable in all things related to Ford products. We believe in this brand because these cars, SUVs, and trucks simply deliver the best performance, reliability, and safety around. At Kings Ford, you can expect to be treated like the valued customer that you are. Whether you come in knowing exactly what you want or need the assistance of our helpful staff to make the right choice, we are there for you. Check out our great services department for checkups and maintenance as well. Our mechanics are all certified to work on your vehicle. Whether it’s a routine checkup or a complete overhaul, we have access to the best replacement parts, equipment, and mechanics around. With Kings Ford, you won’t go wrong.